3x5' Gonzales Come and Take It flag. This nylon flag is digitally dyed for excellent outdoor performance and durability. The flag comes with the standard canvas header and brass grommets and feature four rows of lock stitching on the fly end. Try a historic Gonzales Come and Take It flag from All Star Flags. 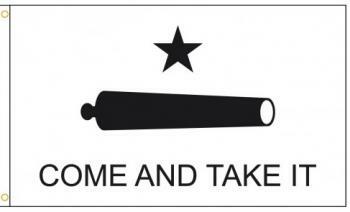 The Gonzales Come and Take It flag features a white background with a black cannon and a black star with the "Come and Take It" slogan underneath. The flag derives from the Texas Revolution against Mexico when a group of Texans resisted a group from of Mexican forces who were under orders to take back the cannon that they had previously provided to the people in Gonzales some years earlier.